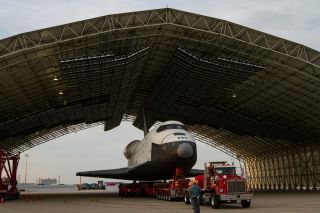 The space shuttle Enterprise, mounted on transport vehicle, is seen under a hanger at John F. Kennedy (JFK) International Airport in New York. A NASA space shuttle prototype and high-fidelity shuttle replica will make some big moves in New York and Houston on Sunday (June 3), and residents in both cities have a chance to spot the winged spacecraft — one by sea and the other by land. In New York City, NASA's space shuttle Enterprise will be visible from some of the city's beaches and coast when it takes a barge from Jamaica Bay to the New York Harbor. The prototype shuttle, which never flew in space but was used in pivotal landing tests, is destined to go on public display Manhattan's Intrepid Sea, Air and Space Museum. Today, the shuttle will be craned onto its barge for the upcoming sea ride. While New Yorkers will get to see Enterprise sailing on a barge, the sight of a space shuttle on the water is one some Houston residents have already seen. The space shuttle replica Explorer arrived at a dock in Houston's Clear Lake on Friday (June 1), and on Sunday the shuttle will parade its way from the lake to Space Center Houston, a visitor's center for NASA's Johnson Space Center that is home the agency's astronaut corps and Mission Control centers. After shipping out from JFK, Enterprise will make its way toward New York Harbor by traveling along the shore of Queens and Brooklyn. The planned route will bring Enterprise by the Gil Hodges Memorial Bridge at 3:30 p.m. EDT, slip by Coney Island at 4:19 p.m. EDT and then pass under the Verrazano Bridge at 5:34 p.m. EDT before pulling into a temporary dock in New Jersey's Port Elizabeth. Space shuttle Enterprise, mounted atop a NASA 747 Shuttle Carrier Aircraft (SCA), is seen as it flies near the Empire State Building, Friday, April 27, 2012, in New York. This is only the first leg of Enterprise's sea trip to the Intrepid. On Tuesday (June 5), the shuttle will finish the journey by leaving Port Elizabeth at 9:15 a.m. EDT, passing the Statue of Liberty at 9:50 a.m. EDT, floating up the Hudson River by the World Trade Center's Freedom Tower at 10:40 a.m. EDT and arriving at the Intrepid museum at about 11:30 a.m. EDT. The Intrepid museum is built on the retired World War II aircraft carrier. Enterprise will be temporarily displayed on the Intrepid's deck until its final display is complete. The shuttle prototype was previously displayed at the Smithsonian Air and Space Museum's Stephen F. Udvar-Hazy Center in Chantilly, Va., but was replaced in April by NASA's veteran orbiter Discovery. A high-fidelity space shuttle mockup arrives at a Houston dock on June 1, 2012, via barge to be delivered to Space Center Houston and placed on public display. While Enterprise makes its way through New York Harbor Sunday, a different kind of shuttle will parade through part of Houston. Houston's space shuttle replica, formerly called "Explorer," will take an early-morning trip from its dock at Clear Lake to the Space Center Houston by way of the area's NASA Parkway and NASA 1 Bypass. The trip begins at 5 a.m. CDT and ends at the center 9 a.m. CDT. From 10 a.m. to 1 p.m. CDT, Space Center Houston officials will host a free welcome celebration for the shuttle replica in the center's parking lot. Viewing opportunities of the shuttle mockup, NASA space exploration exhibits and other activities are planned. The space shuttle replica was previously on display in Cape Canaveral, Fla., at the Kennedy Space Center Visitor Complex, the welcome center for the nearby Kennedy Space Center spaceport that served as the homeport for NASA's space shuttle fleet for 30 years. NASA's youngest shuttle Endeavour, meanwhile, is being prepared for its cross-country trip to Los Angeles, where it will be delivered to the California Science Center for public display. Editor's note: Spot the Shuttle! If you snap a great photo of space shuttle Enterprise in New York City or Explorer in Houston and want to share it with SPACE.com for a possible story or gallery, send pictures and comments to managing editor Tariq Malik at: tmalik@space.com.